I think Late Afternoon will win Animated Short. Watch it for yourself and see why. Documentary Short I think will go to Period. End of Sentence. It deals with an important and less well-known topic that is sure to invoke a lot of passion, especially from the Academy’s female voters I would imagine. As for Live Action Short Film, I think Marguerite will most likely win. It just seems like the most universally likable of the bunch. On the other hand, another nominee called Detainment has well, this going on. Friendly advice to all aspiring filmmakers and storytellers in general: If you are going to make a story about a tragic real-life event where those close to the victim or people involved are still alive, then do literally everyone a favor and ASK THEM FOR PERMISSION FIRST. I hope this loses, I support the mother of James Bugler and think it is totally inexcusable how she wasn’t even informed the movie was getting made. How utterly heartless, to re-traumatize a woman whose young child was brutally murdered by making a film about that tragedy without her knowledge, let alone consent or support. What do you think will win these categories? Will Detainment win Live Action Short after all? Maybe the current political climate allows the archival footage-only 7-minute long A Night at the Garden to pull off a major upset for Documentary Short Subject? I’m interested to hear your analysis and predictions. Fortunately I will get to see all the short subject nominees in February before the Oscars, so I am not predicting until then. More controversy! This one seems like a big deal. Oscar-nominated short film “Detainment,” about a notorious real-life child abduction and murder, has sparked outrage in Britain from the victim’s mother and from thousands of petitioners demanding that the Academy Award nod be rescinded. The 30-minute film centers on the 1993 killing of 2-year-old James Bulger, one of the most shocking criminal cases in modern British history. Two 10-year-old boys lured the toddler from a shopping center near Liverpool, then tortured and killed him. The film relies on transcripts of interviews with the killers to re-enact the events. “I cannot express how disgusted and upset I am that this so-called film has been made and now nominated for an Oscar,” Fergus tweeted shortly after the nominations were announced Tuesday. 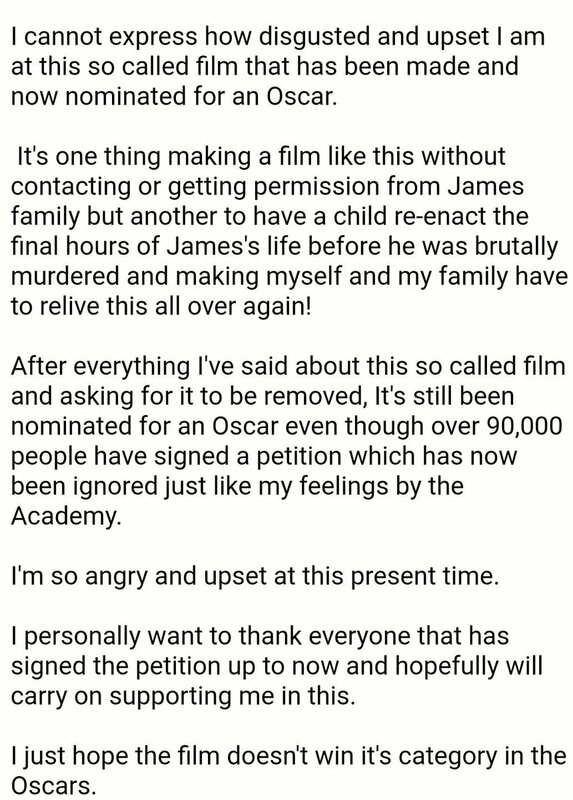 A petition with the title “Stop the Jamie Bulger movie from being shown and taken off the Oscars shortlist” has garnered almost 100,000 signatures. Lambe, who is Irish, has said he was attempting to add some shades of gray to a case where many Britons see none. He denies accusations that his project is sympathetic to the two murderers, who were held in juvenile detention until they turned 18 in 2001, at which point they were released on parole and given new identities. Lambe has also said he is sorry for not contacting James’ family about the project before it was made. Fergus had already been a vocal critic of “Detainment” before its Oscar nod for best live-action short film. Lisa Young, who started the petition, called the movie “a heartless thing,” especially as James’ family was not consulted when it was being made. The Twelve Media-produced film had won several accolades ahead of making the Oscar shortlist, including at the Odense Film Festival, Cannes Lions and the Krakow Film Festival. I’m bumping this thread as well. What do you all think the winners will be and what should they be? I thought I would share this with you all. The audience votes might not mean anything, but I find it interesting what a landslide with 89% Skin won Live Action Short by as the favorite of the category’s nominees. In Documentary Short Black Sheep has the most votes with 50%, with Lifeboat in 2nd with 33%. My prediction for that category Period. End of Sentence is in 3rd with just 17%, which makes me wonder if that film will end up being one of the things I predict for the longest time but call BS on once I finally do see it, like I did a couple years ago when I predicted Ave Maria would lose Live Action Short. After I saw that and Stutterer, I thought to myself, “Oh yeah, well obviously it will be Stutterer,” and it was! In Animated Short, which is the closest, Bao is up front with a decent 40% of the vote, while my current predicted winner Late Afternoon is in 2nd with half of that amount, 20%. I’m planning on watching the Oscar Shorts later this month. Are any of you planning on checking them out? Have you seen any of them? I’ve only seen Late Afternoon, One Small Step, Bao, Black Sheep, and End Game out of the 15 nominees. Seen most of the 15. Live Short – Marguerite probably wins. Animated Short – Bao but ones with animals have a good record on this category. Doc short – Lisa Taback should get Period over the line here. Also hits all the right buttons in this era. Many markets will be showing the traveling road show of the Oscar shorts starting this Friday (with a couple additional shorts in the animation collection to fill out the TRT). For the first time I saw a lot of the shorts prior to nominations and it didn’t help very much, so will just go back to coin flipping and gut predicting. I am pretty solid on Bao and Mother but still considering Endgame, Period, and Black Sheep in Doc short. The audience votes might not mean anything, but I find it interesting what a landslide with 89% Skin won Live Action Short by as the favorite of the category’s nominees. In Documentary Short Black Sheep has the most votes with 50%, with Lifeboat in 2nd with 33%. My prediction for that category Period. End of Sentence is in 3rd with just 17%, which makes me wonder if that film will end up being one of the things I predict for the longest time but call BS on once I finally do see it, like I did a couple years ago when I predicted Ave Maria would lose Live Action Short. After I saw that and Stutterer, I thought to myself, “Oh yeah, well obviously it will be Stutterer,” and it was! In Animated Short, which is the closest, Bao is up front with a decent 40% of the vote, while my current predicted winner Late Afternoon is in 2nd with half of that amount, 20%. Those are prediction votes, not preferences. And when you looked at the numbers, only twelve people had voted in documentary short and twenty in animated. I did not understand that they were not preferences and I couldn’t figure out how to tell how many people were merely predicting. Thanks for the info clarifying the polls. One Small Step, Fauve, Black Sheep and A Night at the Garden are free on Vimeo. Late Afternoon and Bao on Youtube. Seen all 15 of the shorts…there will be a slugfest about the shorts posting soon. Here are my thoughts…. Doc Short: Easily the weakest of the three categories. Black Sheep is more narrative than documentary and left me cold. A Night at the Garden has no business being in this category. It’s seven minutes of newsreel footage in search of an actual story. Lifeboat is good, but not really as powerful as it should be. Also, films about the refugee crisis have been nominated in recent years, but not won. Period is charming and uplifting, but the largely male voting bloc of the Academy may not respond to a film about women’s sanitary products. Endgame felt like a complete story, has the Netflix factor, and has two recognizable Oscar-winners directing it, and manages to be emotional without feeling exploitive. I expect either Endgame or Period to win here. Animated Short: A really fantastic group of nominees. I had the most emotional reaction to Late Afternoon, a gorgeous look at an elderly woman struggling with her memory. Bao, Weekend, and One Small Step are all charming and touching looks at Parent/child relationships, but with wildly disparate animation styles. And Animal Behavior is a raucous comedy, almost like the pilot of an Adult Swim-style comedy series. I would love for Late Afternoon to win, but my money is on Bao. It’s charming, emotional, has the Pixar brand behind it, and is likely to have to most popular appeal. Live Action Short: You’re going to need a valium after watching this category–easily the most depressing slate of films in any category. Let’s start with Mother. It’s a gripping piece of acting and directing, but it ends without any real resolution– it kind of just stops, and I really hated that. Detainment really annoyed and repulsed me, and considering all of the controversy surrounding it, I can’t imagine anyone voting for it. But kudos to the two lead child actors, who are acting circles around all of the lead actor nominees. Fauve is certainly an interesting film, bur the climax felt tacked on, and the movie doesn’t really earn the emotional payoff. I was left wondering what the point was. That leaves Marguerite and Skin. The former is slight, but incredibly charming and poignant, and compared to the others, it’s downright joyous (a low bar to be sure). That alone could make it standout in this field. But I’m going with Skin. It’s the most accomplished piece of filmmaking. It has a strong plot and killer performances from recognizable actors including Jonathan Tucker and Dumplin‘s Danielle McDonald, as well at the boy who plays the young Randall on This is Us. It’s also the only American film among the nominees. Hi, I’m reading a lot that in the Animated Shorts it’s Late Afternoon that seems to be striking a chord with people and is the artistic and emotional pick for “Should Win” but that it’s Bao which is the near universal pick for what realistically “Will Win”. Thing is I still can’t manage to track down the Late Afternoon short anywhere online. Can anyone post a link? I have seen One Small Step and Bao, and I preferred the story in One Small Step, but much preferred the animation in Bao.